Who wants breakfast? How about a side of Android 4.3 with your sunny-side-up new Nexus 7? 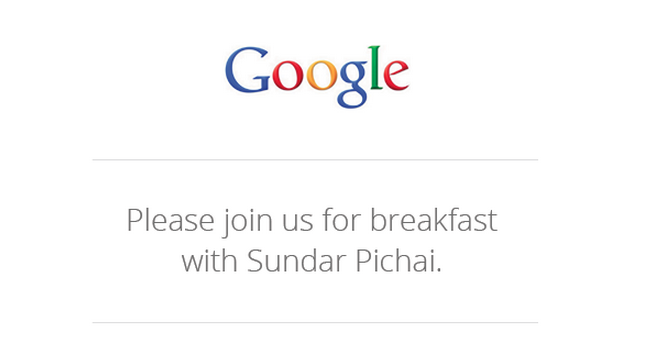 At Google’s planned breakfast event with Android and Chrome boss Sundar Pichai that is taking place this morning, we may be snacking on both, along with some Chrome news as well (Chromecast?). We’re here in San Francisco to join in on the festivities, so whatever is announced, will be seen here at DL. And unlike yesterday’s get-together with Verizon, this one is streamed live for the world to see. Yes, that means you are coming along for the ride. Get your bibs on, it’s time for a Google event!